Acts as an antioxidant, has anti-aging effects, reduces blood pressure, inhibit blood clotting. Increase the supply of oxygen to the heart, brain, and all bodily parts. This product is made from 100% pure natural Ginkgo Biloba leaf extract. Each capsule contains 30 mg Ginkgo Flavone Glycosides. Contains gelatin, water, corn oil. Poor memory, muscle pains, tinnitus, vertigo, hearing loss, impotence, Raynaud’s disease. Take 1 gelcap daily or as directed by your health care advisor. Discontinue use of this product if experimenting any allergic reaction or other discomfort. There are some species in the animal and plant kingdoms that have been in existence virtually unchanged for several hundred million years. The ginkgo biloba tree, native to Asia, is one such species that has achieved longevity; interestingly, its leaves contain extracts that may help assure that human longevity is experienced with clarity and a satisfactory state of wellness. Ginkgo Trees grow to soaring heights and are recognized by their distinctively exotic fan-shaped leaves that have a notch in their centers. The trees can live for about 3,000 years. It is therefore easy to discern why many articles point to ginkgo biloba as a natural dietary supplement that the elderly can use to their advantage. The authors write that ginkgo leaves are effective for those who have symptoms stemming form reduced blood flow to the brain and extremities. In addition, it has been of assistance to elderly people who have problems with memory and cognitive function such as slow thinking and reasoning, as well as more physical complaints such as tinnitus, headaches and age-related macular degeneration, or loss of sight. In The A to Z Guide to Healing Herbal Remedies by Jason Elias, M.A., L.A.c., and Shelagh Ryan Masline, the authors state, :Ginkgo has a unique ability to inhibit a process called platelet activity factor (PAF). PAD plays a major role in many of your body’s processes, such as blood flow and blood clots. By blocking PAF, ginkgo exhibits tremendous healing possibilities. 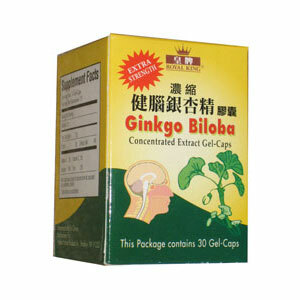 Be the first to review “Ginkgo Biloba Concentrated Extract” Click here to cancel reply.